I’m very tired. If it hadn’t been for this puzzle, I would have gone to bed an hour ago. 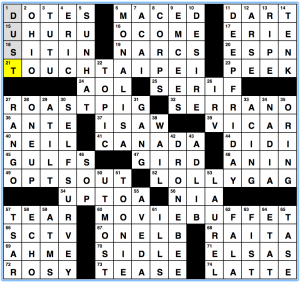 I waited to solve the puzzle and write this post, and it turned out to be a quip puzzle. And a not particularly funny quip, at that. 48a SO I COULD CALL and I could see what was coming. Sure enough, 59a is THEM PORTMANTEAU. Put it all together: HOW I WISH NATALIE PORTMAN DATED JACQUES COUSTEAU SO I COULD CALL THEM PORTMANTEAU. Yeah. That’s the whole thing. Plus Jacques Cousteau is dead, so – ick. There’s nothing particularly exciting in the fill to make up for the non-sparkling theme. This is not a great puzzle. Too tired for any more. I leave you with this, because it’s soothing to look at, even if the music is insipid. Wow. Don’t say you weren’t warned, because it’s right there in the title. 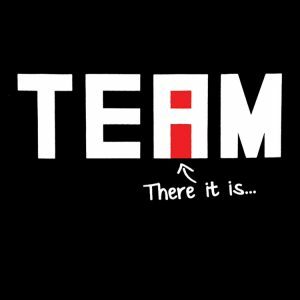 Our punny theme takes the phrase “There’s no I in TEAM” (which also happens to be 1a‘s clue and answer) and extrapolates it. 17a [There’s no X in ___] DIVORCEE. But a DIVORCEE is an ex. 26a [There’s no Q in ___] POOL HALL. But there is a cue. 41a [There’s no T in ___] LAPSANG SOUCHONG. But it is a tea. 52a [There’s no Y in ___] QUESTION. But “why” is a QUESTION. 64a [There’s no C in ___] SARGASSO. But that’s a name of a sea. 73a [There’s no B in ___] HIVE. But there are bees. I liked the theme even though the entries felt inconsistent at times; for example, a POOL HALL might contain a cue and a HIVE might contain a bee, but a SARGASSO can’t contain a sea. But the real struggle was that thorny middle. If you’ve never heard of that type of tea, which I hadn’t (and I certainly didn’t know how to spell it), you were probably in for some trouble. I didn’t feel the crossings were exactly fair either where STUPE at 25d is the answer to [Dummy] and HERALDIC at 9d is the answer to [Like a crest] (I kept wanting HERALDRY or HERALDED even though I know the former doesn’t match grammatically and the latter isn’t exactly true). Or maybe you didn’t know that the [Columbus sch.] at 36d is the Ohio State University, or OSU. 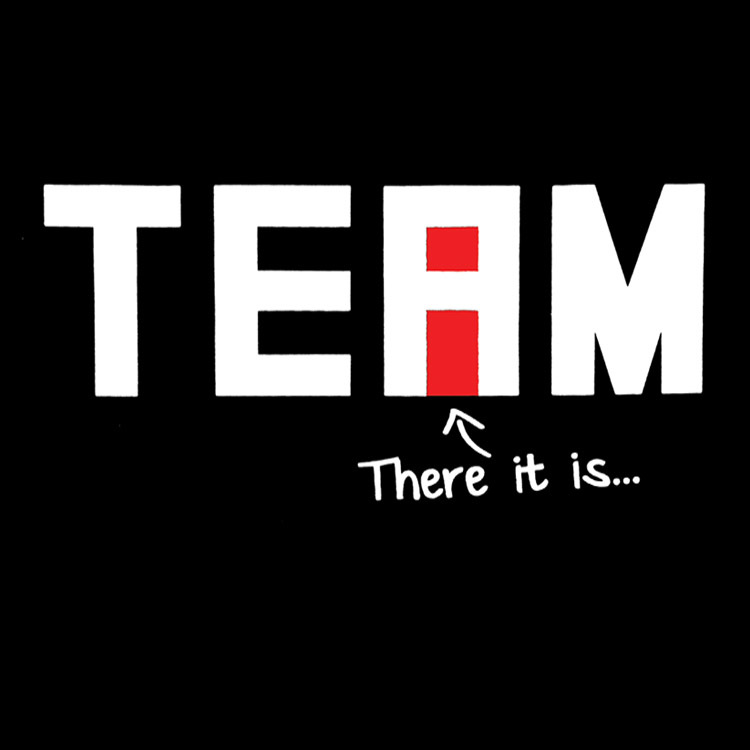 So I’m willing to bet a lot of people got stuck in the middle. But I will give the puzzle and constructor props for cleverness and creativity. And like it or not, that middle grid-spanner is well cheeky! On the whole, I like the theme, even though it beat me up. Another word I didn’t know is LIEDER at 48d [Schubert wrote over 600 of them]. A lied is “a type of German song, typically for solo voice with piano accompaniment.” But while I didn’t know the word, the crosses here were gettable. Besides those two hang-ups for me, there is plenty of good fill: CALCUTTA, “HERE WE GO,” TOLD OFF (a favorite term our family adopted from British-English), DOG DOOR (though I generally hear and use “doggie door”), and AESTHETE. 35a [Grant in the arts] WOOD. That’s Grant WOOD, painter of American Gothic. Overall, a challenging grid but with plenty of rewards to compensate. Howdy, friends. Let’s talk about this week’s AVCX puzzle, a lovely 16×15 grid from Erin Rhode. Tracking back to what I said in the intro, TOUCH TYPE, eh? MOVIE BUFF, eh? DEEP FRIED, eh? SELF SERVE, eh? You get the drift. Add in a well-placed “Soory” and you’re good to go. New Arcade Fire, eh? They’re mostly Canadian, don’t cha know*! All of that aside, it was a pretty good puzzle, eh? *don’t cha know is mostly a Minnesota thing, not a Canadian thing. We apologize for the culture mashup. GAMECHANGER is a very nice revealing phrase. The theme’s extra layer is mostly appreciated post-solve. The middle letters of long acrosses have a scrambled game in them. ERINGOBRAGH hides bingo; CRASHSCENE, chess; PATSDRY, darts; and LISTENINON, tennis. THEMRS was a nice curveball to open with. I appreciated the non-Tinder clueing of SWIPERIGHT. LANECLOSED, TONYNOD and ANDHOW are further fill highlights. This entry was posted in Daily Puzzles and tagged Agnes Davidson, C.C. Burnikel, David Alfred Bywaters, David Kwong. Bookmark the permalink. 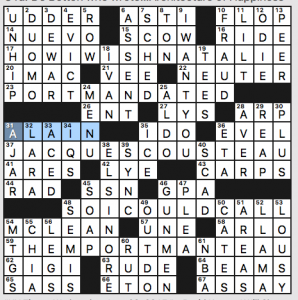 NYT: mildly amusing quip, boring puzzle. Generally I find it kind of annoying that quips require you to get most of the crosses before you can start inferring anything. If the quip is really good, I forgive the puzzle. This one was not that. Can I just copy this post next time I have to review a dud quote puzzle? Not only is Jacques Cousteau dead, but Natalie Portman was 16 at the time of his passing. There was a 71-year age difference. So, maybe make a different wish? Pedantic objection #1: Is there such a thing as one SCAD? Pedantic objection #2: I think of a portmanteau as being the first part of one word combined with the second part of another — motel, smog, etc. So I don’t know if PORTMANTEAU qualifies as a portmanteau. Rebuttal to pedantic objection #2: Guesstimate is a perfectly cromulent portmanteau and it has the same structure as the one in the puzzle. Portmanteau has no overlapping sounds between PORTMAN and COUSTEAU, while guesstimate (or guestimate) does (GUESS and ESTIMATE)..
None at all? I disagree. What’s more, one of the most famous portmanteau words is Lewis Carroll’s chortle, which is a synthesis of chuckle and snort. Truth is, there is no such stipulation of first-part-of-one-word and end-part-of-second-word. Further, more than two words may comprise a portmanteau word. Fair enough. I withdraw pedantic objection #2. Biopic, britpop, Pokemon, taxicab, TomKat, moped, napalm, pleather, modem, SoHo, Tribeca, SeaTac, botox, and of course the constructors’ favorite TAEBO. There are many ways to blend words, portmanteau-style. In a 2006 Language Log post I discuss varieties of lexical blending — this example would fall into the category of “blends with clipping (and no overlapping),” as in fanzine = fan + (maga)zine. I liked the WSJ theme despite not knowing the tea. (The bottom of the puzzle was actually my last to fall. LIEDER was easy for me. 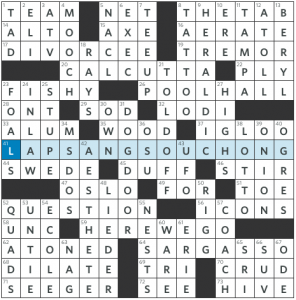 I’m one of the few people who kinda like quip puzzles, but this one seemed oddly out of place. Am I missing something, or is this just a made-up quip? Usually there’s some attribution or context, but I see none here. Perhaps this puzzle was constructed when Mr. Cousteau was still alive (kidding!). And, yes, there is such a thing as a single SCAD, but it’s not used scads of times. Does one find a piscine scad edible, if there aren’t scads of other choices? I listen to The History of English Podcast by Kevin Stroud. I find it fascinating and I think it’s made be a better solver. Some of the content is dry, like listening to a list of vocabulary words, but mostly it’s an interesting blend of the history of England as well as the language. Like many podcasts, there is a member only feed. Coincidentally enough the member’s feed this past week was 15 minutes on portmanteaus, including Humpty Dumpty. 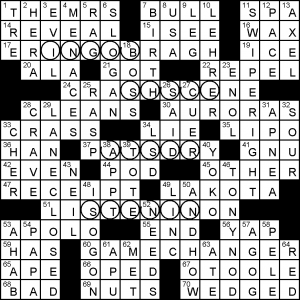 I do not understand Clue 41. Am I to decipher See-Eh-En-Eh-Dee-Eh, or is it just the 4 theme entries which have the added Eh (clue says 3 times)? It’s confusingly written. All it’s indicating is “eh” being added to the 4 theme entries. The three times it appears in the “spelling out” of CANADA don’t have any further significance. I’d bet my bottom LOONIE that it’s an editorial oversight and that four times was meant. How about C, eh/N, eh/D,eh? As the originator, I now see how I misread the clue. It was hard to get that joke down into a single clue that made any sense at all. Also, can’t believe I let this thing go out the door without a curling reference (says the curler). Okay, that’s funny — and I liked the puzzle a lot, even if I never got the title until I came here. Happy birthday, Canada. OK, I think I finally have it. And my head hurts. I wondered the same thing but didn’t bother looking it up since I wasn’t blogging the puzzle. The closest they are appears to be the Lake Erie Islands, where the Canadian side has an island about 5 miles from an Ohio island. New York and Michigan have land borders with Ontario but Ohio and Pennsylvania are separated from Canada by Lake Erie.